Manchester United have already made discreet approaches over a January transfer window raid for Barcelona defender Clement Lenglet, it has emerged. The young Frenchman has endured a difficult start at the Nou Camp, failing to impress manager Ernesto Valverde since his move from Sevilla this summer. Lenglet shone at his old club, attracting plenty of interest from other major clubs before eventually opting for Barcelona, but he’s since struggled to establish himself in the starting line up due to the presence of big names like Gerard Pique and Samuel Umtiti at the back. It was claimed yesterday by Don Balon that the 23-year-old already regrets his move to Barca and could be considering his future ahead of January. CaughtOffside understands that United have been in touch to re-open talks over signing him after also being in for him during his days at Sevilla. Jose Mourinho’s side look in dire need of new centre-backs after a poor start to the season in which Ander Herrera was used in a back three in the recent home defeat to Tottenham. 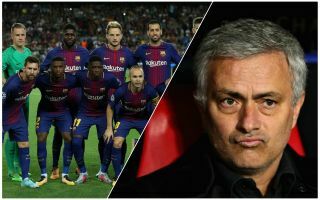 United were known to be in for big names in defence this summer, but Ed Woodward overruled Mourinho’s targets such as Toby Alderweireld and Jerome Boateng for being too old, while Harry Maguire was too expensive. Lenglet would likely be available for around £50million, which is more affordable and a better investment for a player with his best years ahead of him. Still, it remains to be seen if Barcelona will want to let him go so quickly, and there is still plenty of time for him to work his way into Valverde’s starting line up despite a tricky start. Is Clement Lenglet the defender Man United need?